1. Work your plan: What are your dreams and goals? What is your plan? What is your to-do list for the day? Work on it today and every day. Your daily effort is the most productive. 2. Move your body: Daily exercise is another productive thing to do. It is the most effective way to sustain your energy, fitness, calmness and drive to face challenges of daily life. 3. Eat nutritiously: Do not eat in a hurry. Sit down and focus on your food and enjoy eating. You may eat to live but watch what you eat because you are what you eat. 4. Drink water: Do not think that you are not thirsty and neglect to stop work for a moment to drink water several times a day. Drink regularly to keep your body hydrated and your brain functioning at optimum level. 5. Learn: Learning is to enrich the mind. Spending time to learn something new every day is a productive way to know more and stay ahead of technology advancements. 6. Plan ahead: Be prepared for a new day ahead of you. Getting organized is the most productive thing to do to extract the most out of a new day. 7. Improve: Ask yourself this question every day: What can I do today to improve myself? Make a small change, do something with a new twist. Do it daily in a small way and you get a progressive improvement over time. 8. Take breaks: Taking breaks is productive. 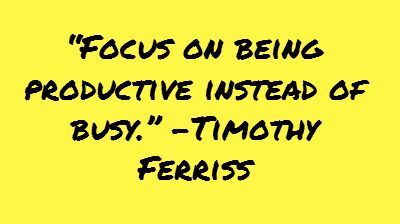 You can’t sustain your concentration and energy without taking breaks. Get off your chair and have a cup of coffee and chat with your co-workers. You will be refreshed when you resume work. 9. Just do it: Do not dilly dally, being productive means not wasting precious time. Take action right away and do what you have planned to do. You will be satisfied and motivated as each task gets done accordingly. 11. Think: Spending time alone to reflect and think of unique ideas is a productive use of time. Gain a new perspective and look at things differently. 12. Count your blessings: At the end of the day, write in your journal or diary about all the good things that have happened to you. It is a great source of daily inspirations and motivation. It is a daily ritual to feel good about what you have achieved in a day. Engage in productive activities every day, it is your consistent effort that impacts your life.